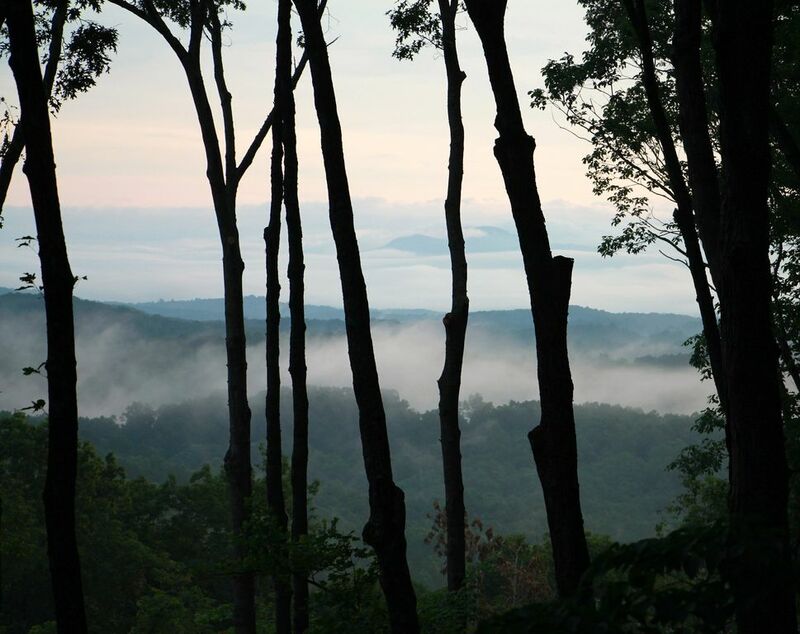 Follow a paved road all the way up Cherry Log Mountain to Treetop Nest Cabin in Blue Ridge. Nestled high above the trees is this BEAUTIFULLY APPOINTED & CLEAN retreat, which is the perfect setting to unplug, unwind, and enjoy nature. Enter the cabin and see views of the treetops, far off mountains, and smokey sunrises. Relax on the elevated porch, eat dinner outside, or enjoy a fire in the cozy living room. Central heat and air conditioning throughout the cabin, along with a ceiling fan in each room make it comfortable year round. There is plenty of room to stretch out and have fun in the open kitchen and living room, or in one of two separate bedrooms, both with full baths. This cabin is perfect for small groups, couples, or families to enjoy. Sorry, NO PETS. Just a short 15 minute drive into downtown Blue Ridge, or Ellijay. The Benton MacKaye trail runs directly in front of the cabin! Lots of festivals and year round outdoor activities within a short drive. Toccoa River and Lake Blue Ridge (great for fishing) both within a 15 minute drive. This cabin SLEEPS UP TO 4: 1 KING bed (with walk in closet, ceiling fan, reading lamps, and windows with mountain views). 1 QUEEN bed (with closet, ceiling fan, reading lamps, and windows with mountain views). All bedding is provided, including extra blankets, pillows, and sheets if needed. Two full bathrooms. Master bath has a large walk in shower, while the guest bathroom has a tub/shower combo. Both baths have extra counter space for storage. The fully equipped kitchen seats up to 4 guests with two additional folding chairs next to the washer/dryer. Gas grill located outside at no additional charge. Grilling tools are in the kitchen. Rates vary by season, but are always reasonable. $90 covers your exit cleaning and trash removal. I also collect a $250 damage deposit at booking, that will be REFUNDED within 7 days of checkout provided there is no damage or theft to the property as a result of the guests' stay. There is a 12% tax on the total amount (this includes a Georgia state tax and a Gilmer County lodging tax). This explains all the fees to book your stay. I don’t charge any other fees. There is an exterior security camera on the side of the cabin facing the front door. Early check-in is available if there is no conflict with schedules. Just ask and I will let you know if it's available. I love this cabin, and I think you will too! It’s a beautiful sanctuary in the treetops. Check the calendar for availability, and let me know if you have any questions. See you soon! I grew up in the suburbs of Atlanta, then lived in New York City for 18 years. I would sit at my desk in the concrete jungle and daydream about living off the grid in a cabin in the woods. That dream finally came true when I moved back to GA and purchased Treetop Nest! I live and work in Atlanta as a real estate agent for a home builder. I'm a part time artist selling my art in stores and galleries around Atlanta. I absolutely love staying at the cabin to refresh and recharge for a few days or a long weekend. I know you'll enjoy it too! Cabin is only a few years old and feels brand new inside with upgrades and high end finishes. There is a landline for emergency and local calls. Not all wireless providers work inside the cabin. Large dining table with seating for 4. There are 2 additional folding chairs available in the Master bedroom closet. There are three stairs to enter the cabin. Once inside, living is all on one level. Cabin is located in between Ellijay and Blue Ridge off 515.